Curtis Mann, the wine, beer and spirits buyer for Raley's Supermarkets, (left) and Gary Fisch, owner of Gary's Wine and Marketplace and Debbie Zachareas co-owner of the Ferry Plaza Wine Merchant, discuss effective wine packaging. 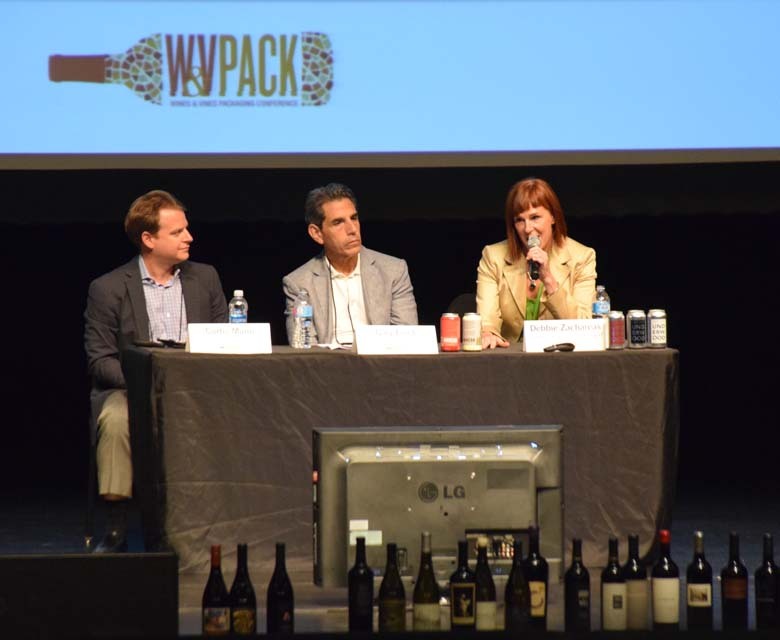 Yountville, Calif.—One of the most popular sessions at the Wines & Vines Packaging Conference on Aug. 17 featured three wine retailers discussing what wine packaging worked for them – and what didn’t. The speakers were Gary Fisch, owner of Gary’s Wine and Marketplace with four stores in New Jersey for an eastern perspective and Debbie Zachareas, the co-owner and partner of Ferry Plaza Wine Merchant in San Francisco and Oxbow Wine and Cheese Merchant in Napa, Calif. Moderating the panel discussion was Curtis Mann, the wine, beer and spirits buyer for Raley’s Family of Fine Stores, which includes 118 supermarkets. Mann mentioned that Raley’s blind tastes all wines so they won’t be affected by the packaging. “It’s still a surprise when a good wine looks like the label was created by a third grader,” he said. Fisch started by flashing popular wines in a wide variety of packages and labels now offered to consumers, including cans, boxes, cartons, plastic bottles and glass bottles in various sizes. He added that the 5-liter format is declining and the growth is in 3-liter boxes. Fisch said customers want authentic “field-to-table” wines where the vineyards matter, but marketers are offering him “tower-to-table” products developed far from vineyards in city office buildings. Fisch used one wine-in-can brand as an example of this type of product. “ManCan. ‘Shut Up and Drink,’ it says. They’re offering men 12-oz. cans of a light, flinty white that’s most appealing to women! Who do they expect to buy them? It’s completely wrong,” he said before adding that it is possible to sell quality wine in 8- t0 12-oz. cans. Zachareas of Ferry Plaza Wine Merchant in San Francisco noted that many people buy cans of wine to take to concerts, the ballpark or to enjoy while making the ferry trip across the San Francisco Bay. She said she hates heavy bottles, and added that some of the greatest French wines use lighter, classic bottles and it doesn’t keep people from buying those wines. She and her partners decided not to sell the massive bottles, but she admitted that some consumers still think a wine in a heavy bottle must be better quality and are willing to spend more for it. Label paper that isn’t durable is another problem for retailers “Paper should be scuff proof — especially for Champagne and large-format bottles,” she said. Zachareas noted she once carried a good wine in individually hand painted bottles that were quite attractive, but the vintner couldn’t deliver wine when needed as it was so time-consuming to paint the bottles. Black labels can be very difficult to read even if they look elegant, particularly if the lettering is also fairly dark. “I do like beautiful pictures,” she said, though she acknowledges that The Prisoner, with its dark – visually and themed – label, has become very popular with a stark, depressing image. And some excellent wine does feature ugly or amateurish art work. She noted that older bottles of Oregon wine seemed to include every member of the family on the label. Other speakers at the conference discussed market research on packaging and labels from the point of view of the consumer. It is critical that retail wine buyers are 'strictly' focused on the what drives a consumer to buy.....anything. If I were a pilot, I would not fly in the fog with my instincts. I would fly by my instruments while keeping my veteran 'touch' on the Control Column. Designing to the 'consumer first', always considering retailer 'opinions' is key to successfully introducing brands. When designing OZV, Moss Roxx, Old Soul or Lodi Estates for Oak Ridge Winery, these exact elements were used in my design. "Who is it that is being targeted, how do they think, what drives their decisions? Now, design a package. Retailers who focus on learning what drives psychographic behavior will dominate in the future as wine marketing & marketers mature. Added to that heavy bottle thing- we also hate if the bottle is too wide! I'm looking at you, Michael David Winery and Orin Swift! Those bottles DO NOT fit in the racks and have to be stacked, or quarantined to the wall, away from all the other wines in that category. If that wine already has a following, sure, people will go looking for it. But an unknown wine, no matter how delicious, is just going to die on the shelf. Amen to the comment about some bottles being "too wide." I can't tell you how many times I've been grateful to finally be rid of a wine that is too big to fit in the rack, or to ship in a standard styro shipper. I'm much less likely to reorder a wine that requires special treatment simply because of the bottle, or to recommend that wine to a mail-order customer if I have something else that works for them. Orin Swift is a prime offender, but I see it most often from champagne and especially tall "hoch" bottles from Alsace and Germany. Will individual cans of wine become mainstream? Doubtful as people want volume and value. Thus the success of bulk-size box wines. And as far as screw tops go: Any wine under $100 should have a screw top.